According to folklore, quilts were often used as signals to indicate a station on the Underground Railroad. Other stories describe maps stitched into quilts or directional cues hidden within the secret meanings of quilt block names. 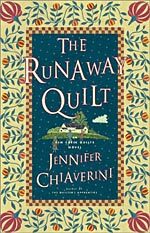 Though some historians dispute these claims, the evolution of the legend continues to unfold within the pages of “The Runaway Quilt ,” Jennifer Chiaverini’s fourth and latest edition to the Elm Creek Quilts Novels. The novel takes readers back to a Pennsylvania farming community divided by the issue of slavery. Sylvia Compson — the 75-year-old protagonist of Chiaverini’s first novel, “The Quilter’s Apprentice” — returns again to discover evidence of her ancestors’ courageous involvement in providing safe haven to fugitive slaves. “Following clues provided by family tales learned in childhood, Sylvia discovers a long-forgotten trunk in her attic containing an antebellum Log Cabin quilt distinguished by a black central square — a signal, according to folklore, of sanctuary to slaves escaping north along the Underground Railroad,” says Chiaverini. Also found in the trunk is the memoir of Gerda Bergstrom, the spinster sister of Sylvia’s great-grandfather, Hans. As Sylvia quickly learns, her ancestors indeed were involved — if unwittingly. When Hans’ wife tacitly copies the quilt of a local abolitionist, she innocently marks Elm Creek Farm as a safe haven for fugitive slaves. For one long, dangerous winter, the Bergstroms share their home with a runaway slave pregnant with her master’s child, as well as other slaves who follow. The slave catchers are never far behind. In The Runaway Quilt, the characters debate the meaning ascribed to the black center squares, just as they do in real life. As the story unfolds, Chiaverini attempts to provide an explanation for the evolution of the legend, honoring the oral tradition while also adhering to confirmed historical fact. Chiaverini notes that the earliest written references to the Log Cabin block did not occur until 1863, with the pattern itself not seeing publication until 1869. A former adjunct instructor for the English department at Penn State, Chiaverini says she never intended to write a series. She wrote her first novel as a gift for the quilters who blessed her life with their friendship. After the positive response to “The Quilter’s Apprentice,” however, she returned to Elm Creek for the sequels “Round Robin” and “The Cross-Country Quilters.” Though presented as a series, she says the books are written so they may be read independently of the others. The series also has strengthened her interest in American history and especially women’s roles in shaping that history. She plans to explore that interest in future Elm Creek Quilts novels as well as in books outside the series.